Hello Julien. How have things been evolving since we last met 2 years ago? Hello Yannig. Things are going well, as you can see (he points at the new office space). On the community side, we now have more than 50,000 designers on our platform, and on the commercial side, our turnover is doubling every year. This allows us to grow our staff, to chase new clients while increasing business with existing clients. We also get more and more positive word-of-mouth from many people, small clients or big commercial accounts, who turn into partners when they recommend us. For example, we worked for Veolia on a naming project. We got access to this brief via their traditional agency, who convinced Veolia’s management to use crowdsourcing and Creads for this particular project. The project was a great success for us, and the community of creatives loved it too! Why did this particular agency recommend crowdsourcing? Why did they choose you? We worked with this agency before, and they knew we were very responsive. You know, agencies are often under tremendous pressure and have to comply to very tight deadlines, and we have the capacity to handle various projects at the same time on our platform. Since we are very reactive and have a big community of creatives, we helped them to get lots of original ideas in a very fast way. And why did the community love this particular project? The community liked it for a variety of reasons: Veolia is a big name and creatives were able to identify with this particular company, the prizes were higher than usual on our platform, and the brief was precise and well-written. The fact that the contest initiator was an agency, who is used to writing creative briefs, helped a lot to come up with a crystal-clear brief for the community! Do you still organize contests on ad hoc branded websites? When a big client comes to us to launch such an initiative, they often want a branded contest website on their own. They don’t want to compete with entrepreneurs or real estate agents who offer several hundred Euro for a design on Creads. They want their own contest on a separate website. And to answer your question: we still organize contests like this, and even if these contests remain exceptional, the demand is growing. We have just launched a stamp design contest for La Poste, last year we hosted a photo contest for the cheese brand Caprice Des Dieux, we also organized a participative campaign for Hyundai… But we don’t list these initiatives on our website, and we don’t promote it among our community, because we don’t target the same individuals. We consider contests on Creads.org and contests on ad hoc websites as two separate activities. How known is Creads beyond France? In the French-speaking countries, we have quite a notoriety because we have been a French platform from the early days. We are present in Spain and Japan, have just finished translating the website into English, and are actively growing our international community. This will fuel our expansion plans for 2013, because we want to sustain our 100% growth rate. We plan to grow in Spain, for example, because few crowdsourcing platforms are available in Spanish. Lots of English-speaking platforms exist, and we tend to favor the markets were creatives have few choice, like Spain. We have many Spanish-speaking participants on Creads, and they’re craving for Spanish briefs. In Japan, we face other challenges like the distance, the alphabet, the culture… but we have ambitious plans there too. The interesting thing with internationalization is that we see interesting synergies between countries. Not only is it prestigious to present Creads as an international company, but the community is also keen to work for international clients. Creators are curious and very open, and they love to work on briefs from other countries, it is very stimulating for them! Can you tell me more about elite contests? Yes. Elite contests have been created to accommodate our two audiences: clients and creatives. The former are looking for high quality output from the crowd, the latter seek more collaboration with the client, and both want us to be more involved throughout the process. Traditional contests are free participation and our customers can get between 80 and 100 proposals for a logo. Elite contests give to our clients the best creative choice. We pick 5 to 10 creators, who all work on the same brief, and all of them are being paid for their participation. The one creator who has the best idea gives up the IP rights, and gets the biggest share of the prize pool. This allows us to put out different types of briefs to the community. Often they are more strategic for the client, who is looking for confidentiality. This is a major issue for some clients, who are not comfortable publishing a strategic brief on an open platform, without knowing who is looking at it. How do you see the advent of 99designs in France? Our slogan is The Participatory Agency (“L’agence Participative”), and we position our self as an agency, not as a platform. Clients come to us with a project and our role is to advise them about the best way to solicit our community, either through elite or traditional contests. The service that we provide is core to our business, even more with the adoption of the elite contest model. We keep the self-service logic because some of our best clients don’t need to be guided through the process anymore, but the majority of our business involved agency services. Hence, the advent of 99designs in France – and in French – does not change much. We have always had competitors with this marketplace model, this one is just bigger and more powerful. Certainly some of our smaller clients might be interested in this self-serve logic, because it is cheaper, but we don’t see it as a threat. How do you see the future of Creads? Bright. I see a bright future because the traditional agency model is being challenged, brands and organizations tend to reconsider their existing relationships. They are increasingly looking for good quality/price ratios, which is something where we excel. Our offer is disruptive and there are still few comparable actors out there. Even if we encompass other crowdsourcing companies like 99designs or eYeka, we all have substantially different value propositions, which makes it easier to grow. But as every innovative business, we also have to educate the public. Crowdsourcing is new, highly disruptive, and therefore some people don’t trust it. Our elite contests are one way to comfort clients, and if we continue to adapt like this, there is no reason to doubt about the future. And from what I sense from the market, I am convinced that crowdsourcing is a mainstream trend, not a temporary fad. Hello Yohann, could you briefly present yourself and your company? My name is Yohann Melamed, I graduated from Telecom ParisTech, a French engineering school, and I am associate director of Studyka. In my final year, I did a Masters (Mastère Management et Nouvelles Technologies) with HEC Paris, where I met the other two founders of Studyka, Charles and another Yohan. Each of us has a different background: Charles comes from a business school, Yohan comes from an engineering school with emphasis on design, and I come from an engineering school. With that in mind, we started Studyka in 2010. We want to leverage the power of the internet to allow students from different backgrounds to collaborate on projects. Companies can access this talent pool by launching challenges on Studyka, which is a new way to bridge schools and companies. By doing that, they get ideas from Generation Y individuals, different from those they are used to get internally. Students, on their side, get prove their skills and talent in a real-world setting, which can allow them to land jobs at these companies. So the objective is not only to crowdsource ideas, but also to identify talents? Exactly. The idea is really to scout for the best talents, whatever their profile. The advantage for companies is that in front of them they have students that have already worked on the companies’ problems, that have fleshed out a business issue and came up with a solution; this is a major advantage for them. Who have you worked with? Who are your major clients today? Our very first challenge was organized in collaboration with Bouygues Bâtiment Ile de France, a major construction company, and since then we have organized 3 or 4 other contests for the company. We have also worked with France’s leading TV stations TF1 and Canal+, the transportation companies RATP and SNCF, the construction companies Saint Gobain and Eiffage…and recently we have launched a challenge with Google. Two weeks ago, we were at YouTube’s headquarters in London, where the finalists of the Google YouTube Challenge presented their ideas to YouTube’s top management. Do your clients submit real business issues, or are challenges a way to attract a certain pool of participants? It really depends on the company, whether they are looking for ideas or talents. We are there to advise and help them phrasing the challenge to reach their goals. What also encourage them to recruit the students that developped the best ideas, because they will be motivated to develop their ideas further and implement them within the company. Rarely do companies have the opportunity to recruit talents who have already developped solutions for the company, just waiting for the opportunity to implement them! What motivates your community of students? A variety of things: the rewards for winners can be very attractive, the company (brand) can attract the students, the business issue that this company is asking to solve is important, and the possibility to meet managers and network… Of course you also have to take into consideration that they love to work in teams, and since the platform allows that, it is an important factor! It even happened that students, who have met for a Studyka challenge, actually created a company around their idea, went back to the company that initiated the challenge, which turn into paying clients! How do you see the future of Studyka? Of course, we hope to grow the platform, both on the community and on the client side. One priority will be to get more interational clients, which will be an important driver for growth. Last year, we participated in the French Tech Tour, which allowed us to close several deals with people we met during this networking event. The recent contest for Google’s YouTube, which was launched from London and San Francisco, is another example. We hope to grow our international client portfolio, and the community will follow. Today, our community is composed of 99 different nationalities… and we hope to expand that too. 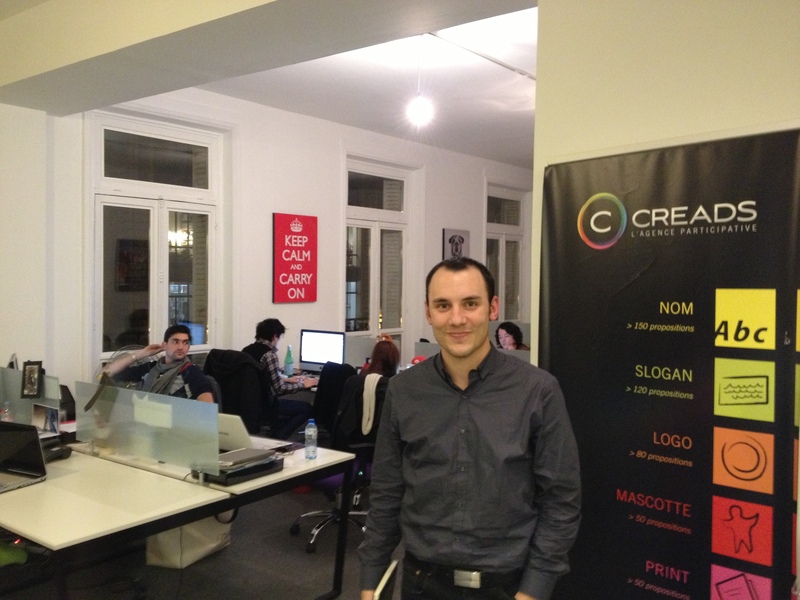 Thank you to Julien (Creads) and Yohann (Studyka) for their time! 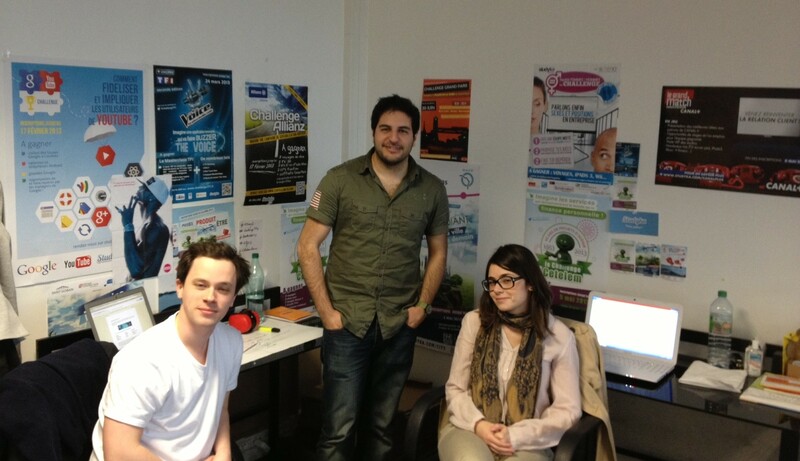 Next Post → Can This Start-Up Become the French Quirky?